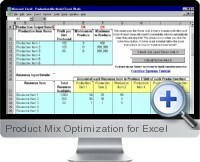 Excel Product Mix Optimization finds optimal production quantities of products and services based on input resource dynamics to maximize profit margin for the business. Variable constraints can be applied to capacity and demand attributes of required production resources to accurately optimize for the best product or service mix for the business unit. Efficiently establishes the optimal mix and unit numbers of products and services produced for available resource utilization. Supports up to ten customizable resource types and six production products or services with associated cost and revenue streams. Optimization ca be applied to manufactured goods and provision of services. Flexible resource types can be defined including human resources, equipment time, floor space, transport and other indirect cost assignment. Minimum and maximum production unit constraints can be applied to focus product mix optimization to external requirements. Resource demand and profit contribution for each product or service is utilized to produce optimization results in an intuitive table format. Additional external risk and sensitivity solutions can be applied to undertake alternative scenario analysis.